In the age of the sound bite the power of the quote should be well understood. And in the classroom it is a wonderful tool to engage any student. Why open with a quote? For the past seven years I have worked in the alternative system in Scarborough, Ontario. We work with students 18 to 20 years of age (it is a funding issue – at 21 years of age they are consider ‘adults’, which means that funding is dramatically reduced). Our students come from all across the city, and arrive at our school for a whole variety of reasons. Primarily, though, they arrive because, for whatever reason, they felt disengaged from the standard system. When working with disengaged students it is particularly important to structure our lessons in such a way as to immediately hook them with effective minds-on activities. The use of a relevant and powerful quotation is a great way to wake our students up and get them on task. It can start a discussion (and sometimes put an end to one) or encourage silent reflection; it can sometimes rouse the mind of a sleepy student and sometimes calm the more hyperactive one. Though not a perfect tool, as it might be easily manipulated or taken out of context (and we should expect that some of our cleverer students will attempt to do just that, which should be welcomed as a teachable moment as noted in John Connelly‘s post “Toxic Discussion or Teachable Moment”), it is nonetheless accessible and engaging. Used as a hook to deeper discussion and further inquiry, the quote is a great way to start a lesson, and it is an effective way to create classroom structure. What about the loss of time? At my school, classes are delivered in two-hour blocks, which means devoting 10 minutes to the quote at the outset of class is, in terms of proportionality, not so great a concern. However, I feel it is worth dedicating 5-10 minutes at the beginning of each class to a quote even following the standard (for Ontario) 75 minute class format. Especially for applied level students it is important to find simple yet engaging minds-on activities, and for them there is great value in consistency and structure. Taking the long view, if we create a structured environment, in time students will work more efficiently and learn to transition between activities more smoothly. A well-chosen quote will get students focused on the content of the day. Ultimately, the brief time dedicated to structuring our classes with a consistent minds-on activity will pay off with less time lost to inefficiency. The need for structure and consistency cannot be understated. Structure makes learning accessible to special needs students and consistency is a comfort for students who lack it in their home lives. I have found it very useful to begin each class with a quote introducing the day’s lesson, much as authors like Coloroso (see Extraordinary Evil: A Brief History of Genocide) and those at Facing History (see Holocaust and Human Behaviour) have structured the introduction to each of their chapters. My students know that at the outset of each class they will find a quote on the board and that they have a few minutes to reflect upon it. In this time they respond using the 3R strategy I learned in a Facing History workshop (see Quote Response Sheet attached developed therefrom). This creates structure and, conveniently, gives me a moment to get the rest of the lesson organized (an especially useful trick for those unfortunate teachers who only have five minutes to run across the building from one period to the next, leaving no pre-class time to do so). What are Some Strategies for Integrating Quotes in My Lesson? The quote can be used at the beginning of a learning module as a spring-board for co-creating learning goals with the class. We might begin a module looking at a specific human rights violations starting with Hitler’s famous rhetorical question “Who, after all, speaks today of the annihilation of the Armenians?” We can ask students “to whom is he referring?” Whether or not they know about either the Holocaust or the Armenian Genocide, we have a discussion point around the impact of knowledge and public awareness. From this we might record together a list of module goals including the need to know how and why events like these happen; how we can make ourselves and others aware of them; how can public discourse affect political action or inaction; etc? Let a student read the quote aloud to the rest of the class (I have been fortunate to always have a student who is more dramatic than I in the delivery thereof, and as a quote is short, even warier readers will often feel confident reading a quote with flair). 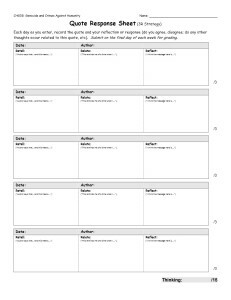 Use the think/pair/share approach to have students co-construct a response the first few days of class. 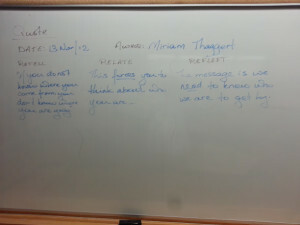 Record shared responses on the board. Finally, use the quote as a peg throughout the lesson and return to it when relevant. If you use quotes in your classroom, I would love to hear what quotes have opened particularly good discussions in your class, and what strategies you have tried with your students.